The two-year-old season is slowly gathering pace. It can be a tricky time of the year if you are searching for bets. They are usually very good or very bad. The classic Mark Johnston type of debutante which equates to an easy winner or poor loser. He has started the season with spirit. A fair winner in Xcelente at Thirsk, and a few others running into places. A couple of two-year-old races for Monday. 2:30 Windsor - A big old Fillies' Novice Auction Stakes. Most look pretty cheap buys. I see a couple have come in for money. Archie Watson's Lambeth Walk could well start odds on. He has notched up a few winners with Electric Ladyland, Lady Kermit (who flew home), and another nice prospect in Exclusively who had a battle with Tim Easterby's Iva Go at Redcar, the pair drawing clear of the field. You will notice that all three winners have been priced 4/1 & less SP. Saxon Gate Stable must have a sharp string of juveniles. Watson has done remarkably well with his horses since coming on the training scene in 2016. Last year, saw a smart string of juveniles including Shumookhi, Nate The Great and Soldiers Call. The latter winning four of his eight starts including a Listed, Group 3 & Group 2 (Flying Childers) and narrowly denied at Group 1 when third in the Prix de l'Abbaye de Longchamp Longines in France. It's very unlikely Lambeth Walk will achieve those dizzy heights but time will tell her story. The stable is in tremendous form with his two-year-olds and they go particularly well when strongly fancied in the betting. The other horse for money is Tom Dascombe's, Dr Simpson. This bay daughter of Dandy Man has been well backed on the exchanges with a few punters bagging odds as big as 6/1. I noticed someone laid a bet of £1000 at 4.6 (7/2), so there is no lack of optimism and still plenty of people wanting similar odds for good money. His debutantes have decent stats at 7/1 & less SP. They can win at bigger odds too so a very capable trainer who know what it takes to win a race. Dr Simpson will need to be pretty smart to win from the draw (1) (see the note, below) unless the going changes or the horses run down the middle of the course or far rail. It is a wide draw with fourteen runners, but a sharp two-year-old can often negate that if speedy enough from the stalls. I must say, it would put me off betting. I will be taking a watching brief. Note: Head in the cloud regarding the draw...saying Dr Simpson had a wide draw. Must have regressed about 20-years as obviously it is against the stands' side rail. Apologies for being half asleep when writing. Sees a seven-horse race with three two-year-olds once raced. Mark Johnston's Alminoor was sent off favourite at Musselburgh and I doubt punters or connections thought they would finish second. Bryan Smart's Proper Beau battled hard and won at odds of 10/1, the duo pulling many lengths clear of the third (who has been beaten since). Alminoor will start at prohibitive odds (depends how you bet) but looks a tough nut to crack. Danny Ocean is quite interesting. I would be tempted to have each way bet on this horse if drifting to fair odds (5/1), but rather have three places. This son of Dandy Man was backed on debut at Leicester but pretty clueless, outpaced in the early stages, but ran on well in the closing stages to finish a creditable third. 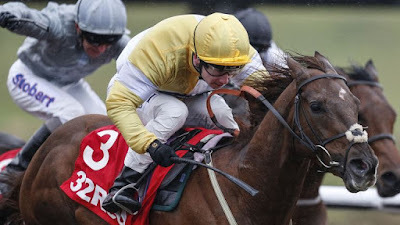 In the ownership of Ontoawinner, Strecker and Burke, he is likely to improve a good deal for that first effort and this stiffer test of stamina will be appreciated. There is a slight concern he will be outpaced in the early stages, but it is often a strength to finish a race at two as many go full throttle and tire at the finish. To be fair, both the first and second favourites look price to chance. If betting on the exchanges, there may be a chance of getting much better odds on Danny Ocean if Johnston's colt is heavily backed but that is about the only angle I can see to bet. Richard Fahey has started the season in a similar vein of form to Archie Watson. Show Me Show Me (owned by Ontoawinner) took the Brocklesby Stakes in authoritative style. While Bendy Spirit represented the stable. He showed good pace before tiring markedly in the final furlong to finish ninth. He was priced as though needing the run. Fahey Brocklesby entrant/runners in previous years have been up to winning standard so I can see this son of Helmet running better today. Certainly, that experience will be a positive and the trainer does well at this course. Those mentioned are worthy of note but unless I see bigger odds available on Danny Ocean I will be taking a watching brief.